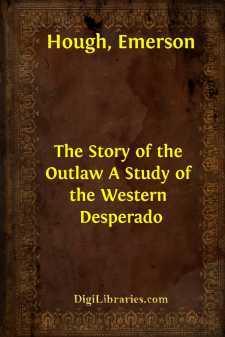 In offering this study of the American desperado, the author constitutes himself no apologist for the acts of any desperado; yet neither does he feel that apology is needed for the theme itself. The outlaw, the desperado—that somewhat distinct and easily recognizable figure generally known in the West as the "bad man"—is a character unique in our national history, and one whose like scarcely has been produced in any land other than this. It is not necessary to promote absurd and melodramatic impressions regarding a type properly to be called historic, and properly to be handled as such. The truth itself is thrilling enough, and difficult as that frequently has been of discovery, it is the truth which has been sought herein. A thesis on the text of disregard for law might well be put to better use than to serve merely as exciting reading, fit to pass away an idle hour. It might, and indeed it may—if the reader so shall choose—offer a foundation for wider arguments than those suggested in these pages, which deal rather with premises than conclusions. The lesson of our dealings with our bad men of the past can teach us, if we like, the best method of dealing with our bad men to-day. There are other lessons which we might take from an acquaintance with frontier methods of enforcing respect for the law; and the first of these is a practical method of handling criminals in the initial executive acts of the law. Never were American laws so strong as to-day, and never were our executive officers so weak. Our cities frequently are ridden with criminals or rioters. We set hundreds of policemen to restore order, but order is not restored. What is the average policeman as a criminal-taker? Cloddy and coarse of fiber, rarely with personal heredity of mental or bodily vigor, with no training at arms, with no sharp, incisive quality of nerve action, fat, unwieldy, unable to run a hundred yards and keep his breath, not skilled enough to kill his man even when he has him cornered, he is the archetype of all unseemliness as the agent of a law which to-day needs a sterner upholding than ever was the case in all our national life. We use this sort of tools in handling criminals, when each of us knows, or ought to know, that the city which would select twenty Western peace officers of the old type and set them to work without restrictions as to the size of their imminent graveyards, would free itself of criminals in three months' time, and would remain free so long as its methods remained in force. As for the subject-matter of the following work, it may be stated that, while attention has been paid to the great and well-known instances and epochs of outlawry, many of the facts given have not previously found their way into print. The story of the Lincoln County War of the Southwest is given truthfully for the first time, and after full acquaintance with sources of information now inaccessible or passing away. The Stevens County War of Kansas, which took place, as it were, but yesterday and directly at our doors, has had no history but a garbled one; and as much might be said of many border encounters whose chief use heretofore has been to curdle the blood in penny-dreadfuls. Accuracy has been sought among the confusing statements purporting to constitute the record in such historic movements as those of the "vigilantes" of California and Montana mining days, and of the later cattle days when "wars" were common between thieves and outlaws, and the representatives of law and order,—themselves not always duly authenticated officers of the law.